Senate Confirmed in May 2012, Mr. Frank Kendall currently serves as the Under Secretary of Defense for Acquisition, Technology and Logistics (AT&L). In this capacity, he is responsible to the Secretary of Defense for all matters pertaining to acquisition; research and engineering; developmental testing; contract administration; logistics and materiel readiness; installations and environment; operational energy; chemical, biological, and nuclear weapons; the acquisition workforce; and the defense industrial base. 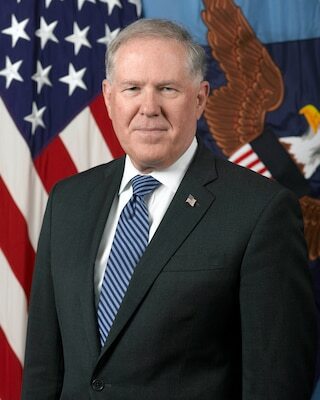 He is the leader of the Department of Defense’s efforts to increase the Department’s buying power and improve the performance of the defense acquisition enterprise. Prior to this appointment, from March 2010 – May 2012 he served as the Principal Deputy Under Secretary and also as the Acting Under Secretary. Mr. Kendall has over 40 years of experience in engineering, management, defense acquisition, and national security affairs in private industry, government, and the military. He has been a consultant to defense industry firms, non-profit research organizations, and the Department of Defense in the areas of strategic planning, engineering management, and technology assessment. Mr. Kendall was Vice President of Engineering for Raytheon Company, where he was responsible for management direction to the engineering functions throughout the company and for internal research and development. Before assuming his current position, Mr. Kendall was a Managing Partner at Renaissance Strategic Advisors, a Virginia-based aerospace and defense sector consulting firm. Within government, Mr. Kendall held the position of Director of Tactical Warfare Programs in the Office of the Secretary of Defense and the position of Assistant Deputy Under Secretary of Defense for Strategic Defense Systems. Mr. Kendall is a former member of the Army Science Board and the Defense Intelligence Agency Science and Technology Advisory Board and he has been a consultant to the Defense Science Board and a Senior Advisor to the Center for Strategic and International Studies. Mr. Kendall also spent ten years on active duty with the Army serving in Germany, teaching Engineering at West Point, and holding research and development positions. Mr. Kendall is an attorney and has been active in the field of human rights, working primarily on a pro bono basis. He has worked with Amnesty International USA, where he served as a member of the Board of Directors, with Human Rights First, for which he was an observer at Guantanamo, and with the Tahirih Justice Center, where he was Chair of the Board of Directors. Over the course of his career as a public servant, Mr. Kendall was awarded the following federal civilian awards: Defense Distinguished Civilian Service Medal, Secretary of Defense Meritorious Civilian Service Medal, Presidential Rank Award of Distinguished Executive (Senior Executive Service), Presidential Rank Award of Meritorious Executive (Senior Executive Service), and Army Commander’s Award for Civilian Service. He also holds the following military awards (US Army): Meritorious Service Medal with oak leaf cluster, Army Commendation Medal, and National Defense Service Medal. Mr. Kendall is a Distinguished Graduate of the U.S. Military Academy at West Point and he holds a Masters Degree in Aerospace Engineering from California Institute of Technology, a Master of Business Administration degree from the C.W. Post Center of Long Island University, and a Juris Doctor degree from Georgetown University Law Center.